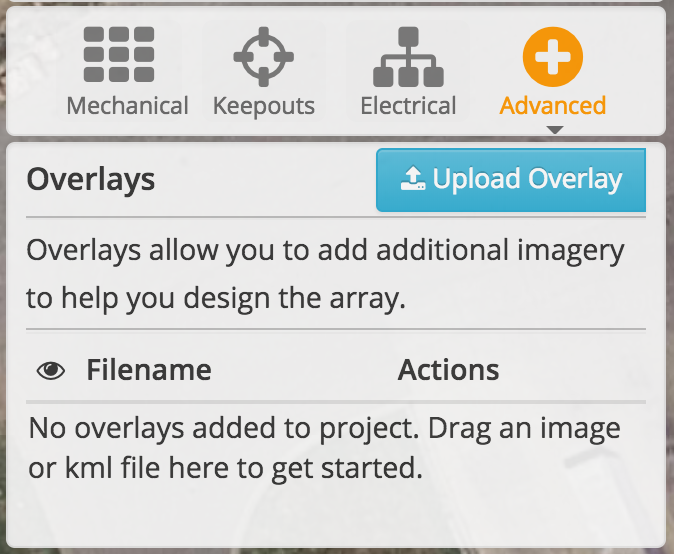 For imagery, external designs, and plansets, HelioScope allows the user to upload images as overlay files in the Designer. First, click the Advanced tab and select Overlay controls. Once there, you will have the option to either upload the imagery by clicking the Upload Overlay button and selecting the appropriate file, or dragging the file into the box below so it turns green. Acceptable file types include jpg, jpeg, png, kmz, and kml. Other file types will not be able to be uploaded. NOTE: KMZs cannot have their transparency or size changed at the moment. If you want to do that in HelioScope, we would suggest using a jpg or png instead. Once your overlay has been uploaded, it will become available for all designs in a project. This overlay can be turned on and off by clicking the checkbox to the right of the image. The mouse icon will center and zoom in the designer on the overlay. Use this to quickly reorient the view on an overlay. To edit the overlay's size, shape, and position, click the edit button with the pencil icon. Once selected, we can control the overlay in a number of ways. The trash can icon will delete the overlay and remove it from the project. Opacity can be controlled with the sliding bar. Higher opacity is to the right, while lower opacity is to the left. What if I have a site plan in PDF? Why isn't my image appearing in the designer? If your image isn't appearing in the designer, it's likely that you're using an unsupported file format. If you're using a KMZ or KML which was created using a TIFF image, that will not appear in the designer either.